Solid earplugs have the most noise reduction. Filtered earplugs or "musician's plugs" have an opening containing a filter that allows better speech/music reception but still reduce damaging high ambient noise. They are the best choice for those that need to hear surrounding sounds for safety reasons, feel solid plugs give too much noise isolation,or want to keep music levels down but preserve the sound quality. "Stuffy" feeling is reduced compared to solid or foam earplugs. No sense of feeling "cut off". Custom made ear plugs reusable with noise reduction of 29.8 dB. Full ear made recessed into the ear for better fit and helmet clearance. Sleep plugs trimmed down for comfort. NOTE: if ordering for 2 different persons, place orders in the cart separately. 20 dB non- interchangeable filter imbedded into custom mold. Good for continuous type noise you would be exposed to in: motorcycling, music concerts, sporting events. NOTE: if ordering for 2 separate persons, place orders in the cart separately. Comes with 1 pair of removable filters of 9dB, 15 dB or 25 dB. 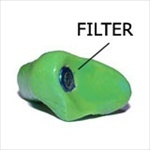 More filters can be purchased separately. Good for continuous type noise you would be exposed to in: motorcycling, music concerts, sporting events.